Where is the Sustainability Courtyard? The Sustainability Courtyard of University of Hawaiʻi Mānoa, highlighted in yellow below, is located between Kuykendall Hall & the Hawaiʻi Institute of Geophysics off of Correa Rd. See also UH Manoa's permit and visitor parking map. Parking is plentiful on Saturday and you can park in any non-reserved spot, including spots that require a permit on weekdays. Going either direction on H1, take exit 24B for University Ave. Turn right onto Dole St. Turn left into campus on East-West Rd. Proceed to the kiosk to get a parking pass ($6 flat fee on Saturday; parking allowed in all non-reserved parking stalls). You can also use the machines at hourly lots to get a $6 all-day pass. Just after the kiosk, turn left on Correa Rd. Find Visitor Parking on the right. The first lots have the most spaces but you might find a spot closer to ShareFest, which is just a little farther down Correa Rd. on the left. For more information, see Visitor Parking on the UH Manoa website. Routes serving the Mānoa campus on Saturday include the 4, 6, 13, and 18, plus express route A. 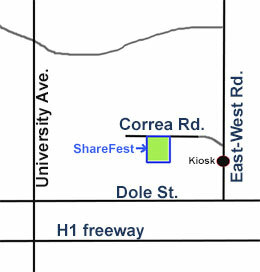 Plan your route by visiting thebus.org and use Correa Rd, UH Manoa as your destination address. See also Bus Information on the UH Manoa website. With Cycle Manoa's bike repair station and a large set of bike racks at Hawaii Institute of Geophysics (adjacent to the Sustainability Courtyard), biking is a great option for getting to the event. If you'd like some route ideas, try the Oahu Bikeways Map. And stay tuned... if a ride that ends up at ShareFest is organized, we'll definitely promote it on the ShareFest web pages! See also Bike Information on the UH Manoa website. The lane that runs Diamond Head direction from the middle of the Campus Center is Correa Rd. Just walk down a short ways from the Campus Center and find ShareFest on the right. If you're on Dole Street, enter campus on the pathway on the west end of Holmes Hall, which is just Ewa of East-West Rd. Go straight and you'll walk right into the event after a building or two!